In chapter 13, John tells us of two beasts he saw. The first emerged from the sea and described the rise of the final world empire (Vs. 1-9). However, the second half of the chapter (Vs. 10-18) describes another beast that emerged from the earth which can only be the final world leader. 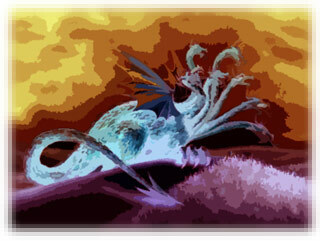 (1) And the dragon stood on the sand of the seashore. Then I saw a beast coming up out of the sea, having ten horns and seven heads, and on his horns were ten diadems, and on his heads were blasphemous names. (2) And the beast which I saw was like a leopard, and his feet were like those of a bear, and his mouth like the mouth of a lion. And the dragon gave him his power and his throne and great authority. In order to understand a little more about the first beast that John saw rising up from the sea, requires us to step back in time to a vision seen by Daniel many centuries earlier. This because the four great beasts Daniel saw coming up from the sea shared many characteristics with the one seen by John. John's Beast had ten horns adorned with ten diadems, seven heads with blasphemous names. He looked like a leopard, with the feet of a bear, a mouth like the mouth of a lion. Daniel's four beasts are described thus.. The first was like a lion with eagle's wings, the second like a bear, the third like a leopard with four heads and four wings on its back, and the fourth had great iron teeth and ten horns. (Vs. 4) "The first was like a lion and had the wings of an eagle. I kept looking until its wings were plucked, and it was lifted up from the ground and made to stand on two feet like a man; a human mind also was given to it. There is little question that the first beast represents Babylon. The Bible repeatedly describes Nebuchadnezzar and the Babylonians as being like an eagle and a lion. For example, Jeremiah 4:7, 49:19, 4:13, and Ezekiel 17:1-3 depict Nebuchadnezzar swooping down on the Jews and carrying them off as captives to Babylon. Additionally, the symbol of the lion was well known in Babylon. Nebuchadnezzar made the city world famous for its magnificent architecture. The Ishtar Gate, constructed by him in about 575 BC, was the main entrance into the city of Babylon. Both the gate itself and the 1/2 mile long main street, called the Processional Way which led to the gate were decorated with blue glazed bricks which featured, in part, reliefs of lions. A lion, which is presently housed in the Royal Ontario Museum, even decorated the throne room of Nebuchadnezzar's castle. The change that came upon the lion possibly symbolizes Nebuchadnezzar's temporary madness and subsequent return to sanity as mentioned in Daniel 4. The bear very probably refers to the Persian Empire that not only conquered the Babylonians but also Egypt and Lydia which was in western Anatolia (now Turkey), between the Black and Mediterranean seas. Croesus, who founded the Mermnad dynasty and became king of Lydia was defeated by the Persian king Cyrus the Great in 546 BC. Lydia's main city was Sardis mentioned as being one of the seven churches in Revelation 1 and 3. (Vs. 6) "After this I kept looking, and behold, another one, like a leopard, which had on its back four wings of a bird; the beast also had four heads, and dominion was given to it. In those days, a head naturally suggested a king or leader of some kind. The leopard that Daniel saw had four heads which leads us to the the next world power - the Greeks. In the light of hindsight, we know that Alexander the Great decisively defeated the Persian king King Darius III in the battle of Gaugamela (331 B.C.). By the time he was about thirty years old, Alexander had conquered much of the known world, creating one of the largest empires of the ancient world, stretching from Greece to Egypt and into present-day Pakistan. Daniel was distressed by what he saw and asked what the beasts were. This explanation is entirely in line with the the interpretation of Nebuchadnezzar's dream, as given Daniel some years earlier See Seven Kings. He was told that Babylon itself was represented by the statue's golden head. However, three more kingdoms would arise in turn after Babylon. The second kingdom would be inferior to Babylon, and it would be followed by a third kingdom of bronze, which would rule over all the earth. The fourth kingdom, which represented the Roman Empire would be as strong as iron... crushing the others. It is no coincidence that the fourth beast had iron teeth. Assyria: Took the northern kingdom of Israel into captivity in 722 B.C. Babylon: Babylon took the southern kingdom of Judah into captivity. A second, like a bear… raised up on one side, and three ribs were in its mouth between its teeth: and they said thus unto it, Arise, devour much flesh. Medo-Persia: Under this empire a remnant of Israel were allowed to return and rebuild the city and the temple. The iron legs in the statue represent the Roman Empire that followed the Greeks. The symbolism of the two legs was not apparent until many years later (in 286 ad), when the Emperor Diocletian divided the Roman Empire into East and West for administrative purposes. Rome: The sixth kingdom was the Roman empire, which at the time of writing was the ruling kingdom. Rome besieged and destroyed Jerusalem, looted and burned Herod's Temple and enslaved or massacred a large part of the Jewish population. However there is yet another empire portrayed... The toes of the statue are partly iron and partly clay, probably symbolizing a continuity of the Roman Empire, mixed in with ‘clay’. The beast becomes an eighth kingdom while at the same time being one of the seven. In other words, the fourth beast with ten horns is a fourth terrible king/kingdom which will devour and crush the entire earth. As mentioned before, some disagree with the idea that the fourth beast represents the Roman Empire because as much as they tried to, the Romans did not devour the whole earth, nor did their empire break the earth in pieces. However, we need to remember that Daniel's fourth beast was not limited to the ancient Roman Empire. In Nebuchadnezzar's image, the fourth kingdom did not stop with the iron legs, but continued into the ten toes. It is the revived Roman Empire that will subdue the earth. See Seven Kings. Others believe that Daniel was prophesying the rise of Antiochus IV Epiphanes, who was ruler of the Seleucid kingdom set up by one of Alexander's generals. And there is good reason for this line of thinking. In the next chapter, Daniel revealed that from one of the four horns, there would arise a "little horn," who would be a vicious persecutor. This monster would exercise his diabolical power to the east, south, and toward the "glorious land" (8:9) a reference to Palestine. He would cause the sacrifices to cease and the sanctuary (the temple) would be defiled. Moreover, this enemy would vigorously attempt to destroy "the holy people" (8:11,24). See The Rise And Fall Of The Empires II. Eventually, the Jews revolted. A guerrilla war under Judas Maccabaeus resulted in the Maccabees defeating the powerful Greek armies in 165 B.C.E. The re-dedication of the Temple is celebrated by the feast of Hanukah in November or December of each year. Note that, according to John 10, even Jesus celebrated Hanukah. What is even more telling, is that from the time that Antiochus erected the statue of Zeus in the Jerusalem temple to the time the Temple was retaken and rededicated, roughly corresponded to Daniel's words that the people of the most High would "be given into his hand for a time, times, and half a time'. Note that the NASB rendering "time, times, and half a time" is not altogether accurate. The Greek word pelag means a division, not necessarily half. Besides which, John also told us that the ten horns of the beast were ten kings who (at the time of writing) had not yet received a kingdom, but would "receive authority as kings with the beast for one hour. If they hadn't received a kingdom in John's day, they certainly hadn't received one in Daniel's time. In other words, events will take place in the future that mirror those of Antiochus IV Epiphanes. A word to the wise... if end time events repeat the actions of Antiochus Epiphanes, then it may be well to study some of his atrocities. While the books of Maccabees do not belong in the canon because they endorse prayers for the dead and the doctrine of purgatory (See The Canon of Scripture and The Apocrypha), they are very valuable in terms of historical details. For example Maccabees says this about Antiochus IV Epiphanes. Most Christians are eagerly looking forward to the return of Christ, which will be the single most sublime event unparalleled in the history of the world. However, Because much of the church believes that Christians will not go through any trials, but will be wafted away to 'heaven' before the going gets rough, it is going to be a harsh reality check when believers find themselves being persecuted, or even killed for what they believe. I have no doubt that, at that time, the faith of many will be sorely shaken because they will think that God has abandoned them, and the Bible has been lying about the timing of the Rapture. Which brings us to the question of who these ten kings might be. We simply do not know yet. However, there are far more more sinister recent developments. We are clearly faced with the prospect of the rise of a 'beast' with ten horns that springs from from the fourth kingdom (the dormant, not dead, Roman Empire), which will devour the whole earth, and will be the dominant force in the world when our Lord returns. Since Revelation 13:4 tells us that it is the dragon or Satan who gives his authority unto the beast, it is obvious that this revived Empire will be under the leadership of Satan himself. However, God is still in control. Although these kings will imagine themselves to be totally in control, Revelation 17 says God is using them to execute His purposes. (16) "And the ten horns which you saw, and the beast, these will hate the harlot and will make her desolate and naked, and will eat her flesh and will burn her up with fire. (17) "For God has put it in their hearts to execute His purpose by having a common purpose, and by giving their kingdom to the beast, until the words of God will be fulfilled. Equally clearly, it is from this revived kingdom that the ten 'kings' will arise, three of whom will be supplanted by an eleventh, who will "speaks great things", blaspheme the Most High and make war with the saints. Both Daniel and John were very clear about this. But who is this eleventh king? Remember that Paul called the antichrist "the man of lawlessness" and "the son of destruction" who would exalt himself above every so-called god or object of worship, and take his seat in the temple of God, displaying himself as being God (2 Thessalonians 2:3-4). It is also the antichrist who, when the First Seal is broken will, astride a white horse, go out "conquering and to conquer"
Additionally, there is no doubt who the prophet Daniel was referring to when he spoke about an insolent "mighty king" who, under Satan's influence, would rise to power, destroying "mighty men and the holy people" and opposing "the Prince of princes" Himself. The eleventh king will "speak out against the Most High", and wear down (make war with) the saints for a set period of time just as Antioches did. However, this time it will not be the Maccabees who defeat this king, but he will be overcome by the Lamb Himself. Note: While we cannot be dogmatic about what exactly is meant by the eleventh king/antichrist making "alterations in times and in law", it is obvious that he aspires to change something God has established. (11) Then I saw another beast coming up out of the earth; and he had two horns like a lamb and he spoke as a dragon. (12) He exercises all the authority of the first beast in his presence. And he makes the earth and those who dwell in it to worship the first beast, whose fatal wound was healed. (13) He performs great signs, so that he even makes fire come down out of heaven to the earth in the presence of men. (14) And he deceives those who dwell on the earth because of the signs which it was given him to perform in the presence of the beast, telling those who dwell on the earth to make an image to the beast who *had the wound of the sword and has come to life. (15) And it was given to him to give breath to the image of the beast, so that the image of the beast would even speak and cause as many as do not worship the image of the beast to be killed. At this point a second beast said to have horns like a lamb, enters the picture. However, there are a couple of very important factors to be considered here. 1) The only person in the Scriptures said to be a "lamb" is the Lord Jesus Himself. - the "Lamb of God who takes away the sin of the world" (John 1:29) . The fact that this second beast is described as a lamb seems to suggest a false mild demeanor. In other words, evil will be disguised under a facade of peace and goodness. 2) Secondly, this second beast is said to emerge from the earth, as opposed to the first beast that comes out of the sea. These contrasting origins have to be significant. The "sea" the first beast arises from being the peoples and multitudes and nations and tongues (Revelation 17:15). The second beast comes from the earth. In other words, it is more than likely that he emerges from the revived Roman Empire and whatever (or whoever) it is that 'mingles with the seed of men'. Certainly this description fits Antiochus Epiphanes very well. As said by Bible commentator Albert Barnes "He pretended friendship, and designed to keep those whom he meant to invade and destroy in a state of false security, so that he might descend upon them unawares. This was his policy rather than to declare war openly, and so give his enemies fair warning of what he intended to do". Which means that the antichrist will also come under the guise of peace and security. Since the concept of a coming world teacher... a messiah, who sets up a golden age on earth can be found in many world religious systems, it is easy to see how a charismatic leader who promises (and seems to deliver) utopia will be accepted nay, even welcomed, by much of the world. Perhaps most ominous of all is the fact that a large portion of the New Age movement believes the present phase of human existence is one of transition, and there is a new age dawning. However, the utopian age will only come about under the leadership and guidance of a world leader/teacher. The second beast will be able to perform supernatural miracles, including calling down fire from Heaven, which will cause many earth-dwellers to erroneously conclude that he is the perceived savior of mankind that will lead humanity into a golden or 'New Age'. As a result, people will obey when he instructs them to make an "image" of the first beast, which he then proceeds to give breath to, so that the image 'speaks'. While we can only speculate as to what a 'speaking image' means, what we do know is that he then goes a step further causing as many that do not worship this image of the first beast to be killed. Note: Your Bible may read, " the number is that of a man" as does the NASB above. However, the 'a' is not in the original manuscripts. Therefore, the verse could very well read the "the number of mankind"
Drawing from Paul Boyer's book, When Time Shall Be No More, Don Closson wrote.. The advent of the computer has caused some to see it as the Beast. One writer noted that if the letter "A"=6 and "B"=12 and "C"=18, and so on, the word computer adds up to 666. The same writer also observed that the words "New York" added up to 666. Some pointed to John Kennedy because he had received 666 votes for the vice-presidency in 1956. Others pointed to Henry Kissinger because his name in Hebrew added up to 111 or 666 divided by 6. Even Ronald Reagan was considered because his first, middle, and last names all had six letters. While theories as to what this number signifies abound... there is one that draws the attention simply because unlike most of the others that attribute the number to a specific individual, this one relates it to the Roman empire as a whole.. a possibility that seems to fit in with the whole revived Roman Empire, fourth kingdom, seventh head scenario. It is true that Irenaeus was very reserved about his interpretation, content to believe that the meaning of the number would be revealed when the Antichrist made his appearance. However, the reasoning makes sense. Since the beast of the sea in Revelation 13 is clearly the same as the fourth beast of Daniel 7, the name could very well make reference not to a single man, but to the name of the 'fourth empire upon earth', which was the Roman empire. Adding together the numerical equivalents of the letters in the word Lateinos results in the number 666. However, at least a couple of the earliest known records of the Book of Revelation, including a 1,700 year old papyrus, dating one century after Irenaeus, gives the Number of the Beast as 616. So do two other codices generally regarded as providing the best testimony to Revelation. However this was refuted by Irenaeus. The fact is that we simply do not know, but will ... in the near future. Ezekiel was, obviously, not talking about literal sheep, pagan nations are not literally wolves, and Satan is not a literal lion. Revelation takes this imagery to a whole new level. Written in the field of apocalyptic writing, it contains a bewildering array of symbols.... beasts emerging from the sea, a 'bottomless pit', a dragon with seven heads, a woman sitting on a scarlet beast etc. However, it is highly unlikely that real monsters are going to rise out of the sea and equally unlikely that we are going to see a literal beast with horns like a lamb that speaks like a dragon. Similarly, although Revelation 17:5 talks about the Harlot with Mystery Babylon, Mother of harlots written on her forehead, it would be foolishness to look for a literal woman with literal writing on her forehead. In Deuteronomy 6:8 Moses told God's people to keep all His statutes and His commandments, and instructing them to "bind them as a sign on your hand, and they shall be as frontlets between your eyes" (verses 2, 8). The hand and forehead probably represented the person's actions and thoughts respectively. In Revelation 3:12 the Lord told the church at Sardis: "He who overcomes, I will make him a pillar in the temple of My God, and he shall go out no more. And I will write on him the name of My God and the name of the city of My God, the New Jerusalem...". Revelation 7:3 has God instructing the four angels not to "harm the earth, the sea, or the trees till we have sealed the servants of our God on their foreheads". Revelation 14:1 says the one hundred and forty-four thousand, have His name and the name of His Father written on their foreheads. Revelation 22:3-4, referring to the time after the second coming, says His bond-servants will serve Him, they will see His face, and His name will be on their foreheads. Since God doesn't literally write Scripture on someone's heart, nor carve laws on our foreheads or in our minds, so having the name of Christ or the Father on one's forehead is not meant to be taken literally, but simply means allegiance to God. Therefore, the mark of the beast should probably be understood as the Satanic equivalent of the 'seal of God'. In other words, it is not a literal mark, but John's way of symbolically describing ownership and loyalty. The 13th chapter of the Book of Revelation tells us that the mark, is equivalent to the name of the beast or the number of his name. "... merely an arbitrary designation, a random combination of sounds. The name conveys the nature and essence of the thing named. It represents the history and reputation of the being named. Similarly, since the name of the beast conveys his nature, spiritual character, history and reputation, receiving his name associates a person with everything he stands for. Since John says "Here is wisdom. Let him who has understanding calculate the number of the beast... ", it is impossible to believe that he intended his first or second century readers to figure out that the numbers 666 stood for a particular person who would be born many centuries later. They were not psychic. In short the challenge was not to identify who the beast would be, but to recognize what he was. And that challenge faces us today. We have to recognize that the antichrist is empowered by Satan and not the savior he will pretend to be. As quoted in Daniel's Prophecy of Antiochus Epiphanes by Jason Jackson. 10 countries for a United States of Europe 20 June 2012. Nick Gutteridge . European Superstate to be unveiled: EU nations 'to be morphed into one' post-Brexit. Irenaeus. Against Heresies (Book V, Chapter 30. Christian Classics Ethereal Library (CCEL).